Pencils, sharpened to a nub, aren’t good very many things. 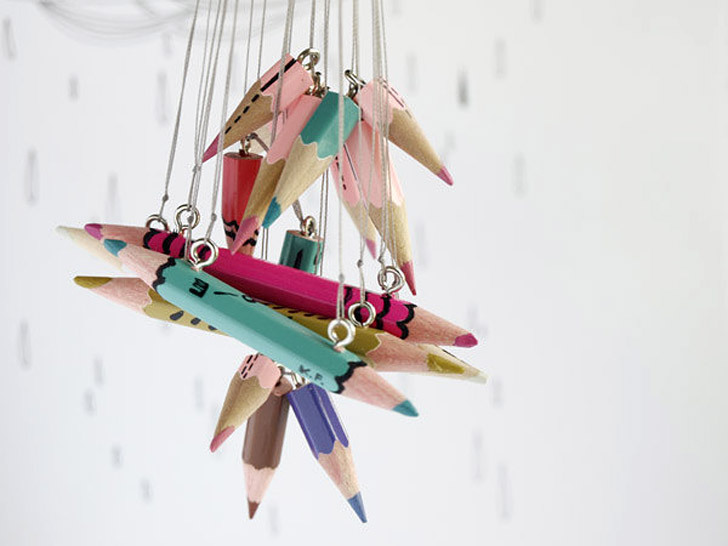 If you’re Dublin-based designer Karolin Felix, however, they’re the perfect size for turning into colorful, whimsical necklaces. Sectioned into bits, each piece gets a slap of paint and varnish before it’s strung from delicate nylon thread. Pick the delicate “Pink Candy” for a small but pointed statement or opt for “Rain” if you prefer abstract motifs. Animal lover? Make tracks with “Birds” or “Cat.” No need to surprise your beau with a bouquet of freshly sharpened pencils (à la You’ve Got Mail); Felix can create a one-of-a-kind accoutrement by custom-painting whatever your heart desires. Pencils, sharpened to a nub, aren't good very many things. If you're Dublin-based designer Karolin Felix, however, they're the perfect size for turning into colorful, whimsical necklaces. Sectioned into bits, each piece gets a slap of paint and varnish before it's strung from delicate nylon thread. Pick the delicate "Pink Candy" for a small but pointed statement or opt for "Rain" if you prefer abstract motifs. Animal lover? Make tracks with "Birds" or "Cat." No need to surprise your beau with a bouquet of freshly sharpened pencils (� la You've Got Mail); Felix can create a one-of-a-kind accoutrement by custom-painting whatever your heart desires.